Former Gawker and Deadspin editor Tom Scocca is launching a site that will run on Civil, the journalism-focused, blockchain-based marketplace startup. Civil is a new publishing platform that will allow readers to support reporters and pay for subscriptions using cryptocurrency. 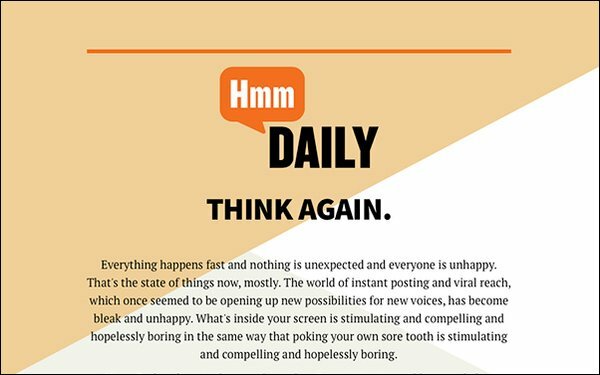 Scocca is hoping his new site, Hmm Daily, will be a home for unconventional opinions and writers, as alt-weeklies struggle to succeed in a tough era for smaller publications. “We're here to criticize the culture and to make new culture, to say the things nobody else might say and to listen for the things we haven't heard yet,” Hmm Daily’s landing page reads. The site is expected to go live in April. Former Baltimore City Paper art director Joe MacLeod will be the creative director of Hmm Daily. Scocca has also worked at Baltimore City Paper, the Observer, Gawker and The Awl — all save the Observer have shut down. He told CJR he wants the same community that was built around alternative site The Awl to read the Hmm Daily. Scocca also told CJR he wants Hmm Daily to be an alternative to The New York Times opinion section. The New York Times has had its fair share of controversy around its opinion section. The company fired Quinn Norton the same day it announced hiring her as the editorial board’s lead opinion writer on technology, after the Twitterverse uncovered past tweets in which she used offensive slurs and referred to her friendships with neo-Nazis. Last spring, the Times brought on conservative op-ed columnist Bret Stephens, a cynic of climate-change science. His hire spurred some readers to cancel their subscriptions. Civil plans to launch several sites this spring in addition to Hmm Daily. Among them is Block Club Chicago, created by a group of journalists who worked at the now-shuttered DNAinfo Chicago, to cover local news.